September 2, 2017 - "Top Dog" Organizes Truckload to Benefit Hurricane Victims. February 17, 2016 - DE Tidal Finfish Advisory Council Meeting Rescheduled for March 16th. May 12, 2015 - BIG ROCK ANNOUNCES FREE CONCERT! April 14, 2015 - NOAA Fisheries Office of Sustainable Fisheries is now accepting applications for the National Marine Fisheries Service (NMFS) - Bycatch Reduction Engineering Program (BREP). January 29, 2015 - DE PUBLIC HEARING ON PROPOSED MODIFICATIONS TO TIDAL FINFISH REGULATION 3502, 3503, 3504, 3505 AND 3506 PERTAINING TO STRIPED BASS. September 25, 2013 - PUBLIC HEARING ON PROPOSED MODIFICATIONS TO 3500 TIDAL FINFISH TO INCLUDE A NEW §3588 ATLANTIC MENHADEN. September 24, 2013 - PUBLIC HEARING ON PROPOSED MODIFICATIONS TO §3518 BLACK DRUM SIZE LIMIT; POSSESSION LIMIT; LANDING LIMIT; DEALER LIMIT. 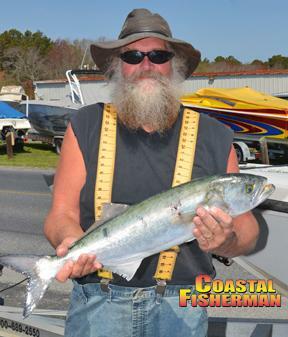 March 1, 2013 - LOOKING FOR A COPY OF THE COASTAL FISHERMAN WINTER EDITION? February 23, 2013 - GOOD NEWS FOR SEA BASS FISHING IN DELAWARE, MARYLAND AND VIRGINIA!!! 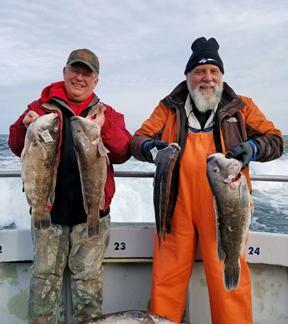 ***SEND IN YOUR PHOTOS (1st issue only 2 weeks away) - We are starting to get ready for the 2019 season, so if you have any pictures you would like to email us of catches since January 1st, you can email them to coastalfisherman@comcast.net. Please include 1 picture per email submission but feel free to submit as many pictures as you would like. Send the pictures at "Actual Size" which is the largest size possible and include all the information about the catch in the body of the email. Feel free to send pictures from any trips, both local and out of area, that you made since January 1st. Thanks!! **COOL NEW FEATURE - If you have any fishing related questions you would like to pose to area Captain's, please email to coastalfisherman@comcast.net. Questions and answers will be published in issues during the 2019 season. Please include first and last name along with where you live. We will only publish your initials and town. 12:14 PM - Big Bird Cropper and his lovely bride, Tammy, hit the South Jetty this morning and released over 20 stripers, measuring up to 23-inches, in addition to hooking a couple of bluefish. One was lost but the other measured 26-inches and weighed 6 lbs. 8 oz. Biggest striper was 23-inches. All caught on, what else... Roy Rigs!!! Bird said that the water temperature got up to 50-degrees when he stopped fishing just before noon. 2:05 PM - Capt. Nick Clemente on the charter boat, "Get Sum" said that the wind was howling up on the Thorofare flats today with water temperature up into the low 60's. With the improvement in weather, we are starting to see more boats on the water. This weekend the flounder were snapping on the Thorofare flats and black drum were caught off the beaches. 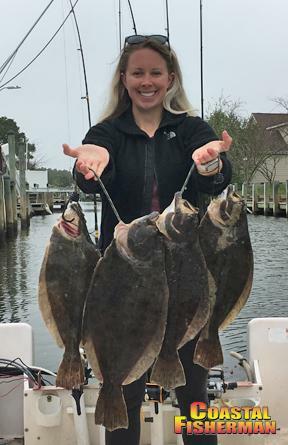 Nate Gregory and Katie Thatcher trolled the Thorofare flats and ended up with 4 keeper flounder, measuring up to 21-inches (Katie’s). Water temperature was 62-degrees and the bite was on the outgoing tide. Mike Johnston also caught some keeper flounder while slow trolling on the Thorofare flats. When it comes to trolling for flounder, those guys have it nailed!! On a side note, Capt. Monty Hawkins on the headboat, “Morning Star” is looking for 2 deckhands. Experience would be nice, but is not necessary. Email Capt. Monty at capt.montyhawkins@gmail.com. I spoke to my foreign correspondent in Monmouth Beach, New Jersey, Capt. Ed Moro, who reported an incredible striper bite in all the waters in central Jersey. Capt. Ed said that anglers are catching fish out front along the beach and in the bays as well with fish ranging greatly in size. The best bite around OC continues to be up around the Rt. 90 Bridge. Today, Kern Ducote had a great day fishing in 54-degree water, ending up with 39 stripers hooked. Largest measured 29-inches. 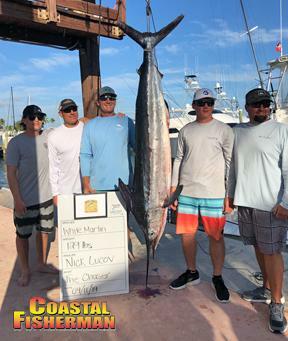 Local boat, "The Chaser" is fishing in "Skip's White Marlin Round-up" and during the action on Day 1 of the tournament they captured a 129 lb. white marlin and currently sit in 5th place in the 3-day tournament. Small stripers are still snapping around the Rt. 90 Bridge. Fish are in the 20-24 inch range. Looks like the black drum are starting to bite along the beaches. 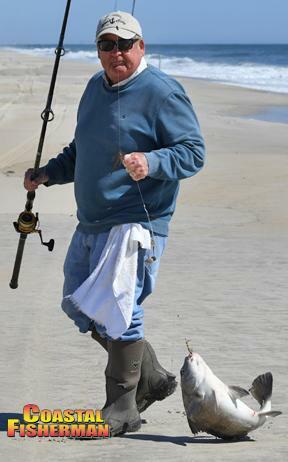 Don Zaiser caught and released one while fishing in the afternoon with clams off 142nd Street. Photo courtesy of Fenwick Tackle. 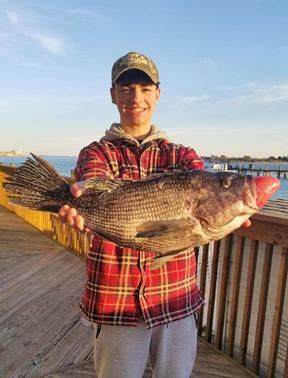 The first black drum of the year was caught today by Allen Sklar while fishing off Assategue Island. Allen estimated the weigh of the fish at 25 lbs. Bill Powell also caught a black drum off Assateague. 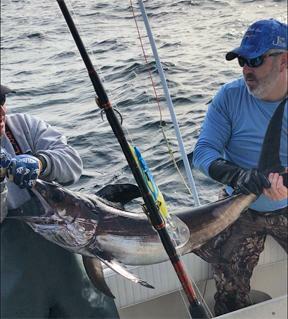 The State of Maryland just released their cobia regulations for 2019. The season is open from June 1st to September 30th. Recreational anglers can keep 1 cobiaper day or up to 3 cobia per vessel per day if there are 3 or more individuals on the vessel. Minimum size is 40-inches total length. 4:34 PM - Big Bird Cropper called in to report that he and John Wittmeyer hit the South Jetty and caught a short striper. Good news was that the water temp was in the mid-40's. Better news was the water temp up at the Rt. 90 Bridge was 58-degrees during the outgoing tide and in the mid-50's in the Thorofare. Just an editorial comment... Big Bird is a great dude and goes out of this way to help anyone and everyone. It would be great if folks this season who see Big Bird on the water would put him on some action or give him the skinny on some intel. He really deserves it and it would be good kharma!!! Hearing about some stripers being caught around the Rt. 90 Bridge. No biggies, but good action on light tackle. 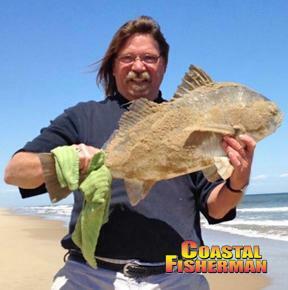 Coastal Fisherman correspondent, Ed Balcerzak reported some flounder biting north of the bridge off Hoopers. Capt. Monty on the headboat, "Morning Star" reported slick calm conditions today with a bit of a swell. Anglers really had to work for their catches of tog. Mark Sun caught his limit and Pat Scida took largest fish honors with an 8 1/2 pounder. 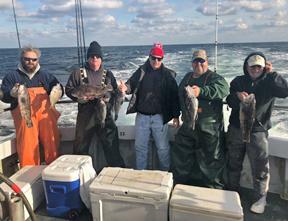 Kern Ducote reported that he was flounder fishing yesterday in the Ocean City Inlet and East Channel, but had no luck. Water temp was a brisk 42-degrees. Went to the Rt. 90 Bridge and ended up catching and releasing 12 stripers. Water temp was between 45 and 48-degrees. Today, Kern headed back to the Rt. 90 Bridge and caught another 9 stripers. Biggest fish was 24-inches. Most measured between 28 and 20-inches..
Anglers on the headboat, "Morning Star" dealt with a fog filled, swelly and windy morning but the tog were biting while the tide was running. Largest fish 2as 20 1/2-inches. There is a lot happening on the striped bass front with stock assessments coming in worse than expected. State is considering some major actions, including big changes to the trophy rockfish season on the Chesapeake Bay. 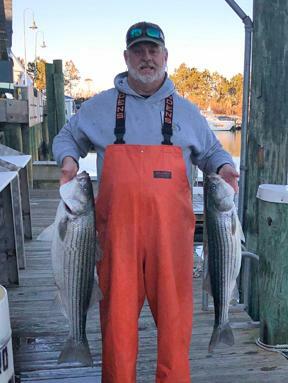 Part of the problem, according to the Feds, is that the breeder population has declined greatly, so targeting the bigger fish during the famous Chesapeake Bay Trophy Rockfish Season may not seem like a good idea. At least right now. Check out the multiple articles listed in our Breaking News section and stay tuned for further developments. Reports are coming in that the bays behind Ocean City are chock full of bunker and crabbing right now is much better than it was last year. Kristen Lenox caught the first flounder of the year while fishing in 6-8 feet of water behind Assateague Island. Fish measured 16 3/4-inches and was hooked on a chartreause Deadly Double with a pearl white 4-inch Gulp Swimming Mullet. I received a report last night from Capt. Jason Mumford on the charter boat, "Lucky Break". Jason said that water temperature at the Assateague Bridge was 50-degrees yesterday. A lot of shiners in the water and birds were working. Half way down the bay behind Assateague, the water was 54-degrees. Sorry there haven't been any postings in a while. A lot going on that kept me away, but we are back at it, getting ready for the season opening issue on May 1st. If you have any pictures of catches since January 1st, make sure you email them over to coastalfisherman@comcast.net. Even pixs of "away from home" trips are always welcome in the early season issues. Today, anglers on the headboat, "Morning Star" ventured out on a calm day with an OK bite. Largest tog was a 10 pounder. Good bite right away until the current quit and the next bite didn't occur for 2 hours. Once the current got up and running, the bite followed. Overall, a nice day. Capt. Monty Hawkins on the headboat, "Morning Star" reported "a nice pick" on tautog today. Not much current, but a lot of double digit fish were caught before the slack. Angles released 5 tog that weighed over 10 lbs. Largest fish was a 30 1/4-incher aht weighed 19 1/4 lbs. 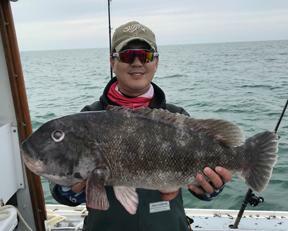 James Kim caught, tagged and released a 29 1/4-inch, 18.5 lb. 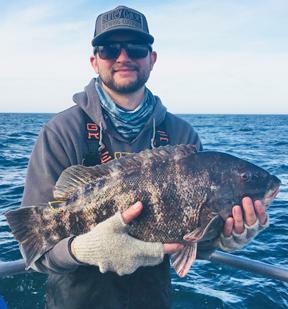 tautog after hooking it with a white crab on an ocean wreck. On a side note, today, via the "Morning Star", the Ocean City Reef Foundation dropped reef block #24,000. The recordsetting block was dropped at Capt. Jack Kaeufer's Memorial Reef. Congratulations to the Reef Foundation. To join (very inexpensively!) just go to their website at ocreefs.org. Capt. Monty on the headboat, "Morning Star" reported better fishing today, but caught a slack current at the end of the day. Before that, anglers caught some nice fish including the pool winner, Justin Leber who caught a 26-inch, 14.5 lb. tog. Capt. 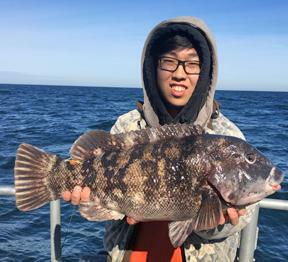 Monty on the headboat "Morning Star" reported some decent tautog fishing today with a good percentage of fish measuring over 20-inches. No limits but a lot of nice fish. Steve Cohen took top fish honors with a 23 3/4-incher. 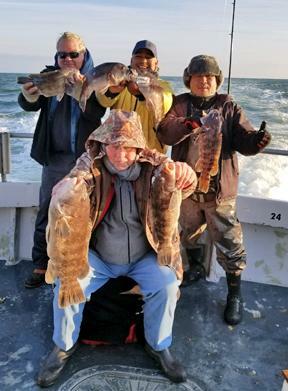 Anglers on the headboat, "Morning Star" are still banging away at tautog on ocean structure. Capt. Monty said that the winds blew over 20 knots all day but some nice fish were still caught. Largest was a 20-incher caught by Bill Keefer. Well, it looks like the dismal 2018 striper season continues. Boats went north and south today and the only fish I heard caught came on the “Fish Frenzi”. 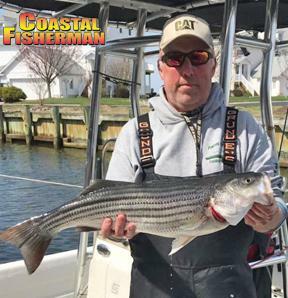 Chuck Wenzel caught a 33-incher while trolling off Fenwick Island. Boats that went south saw nothing. All of the birds looked to be flying north. The good news is that water temps are still around 43-45 degrees, so there is still time left, PLUS they are still catching them off Jersey. Maybe we will be able to bail out the season in the next couple of weeks. Capt. Month on the headboat, “Morning Star” reported a bluebird day offshore with winds never getting over 10 knots. 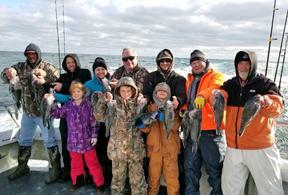 They had one angler catch their limit of 15 sea bass today with several others reaching double digits. Largest was a 17.8-incher caught by Caleb McIntyre. Capt. Monty said that he has openings for tomorrows 10-hour sea bass trip. 4:32 PM - What a difference a day makes. Flat calm this morning allowed boats to get to their sea bass and tautog grounds. Capt. Monty on the headboat, "Morning Star" said that tog had lockjaw today and didn't cooperate. Largest was an 18 1/2-incher. Wow! Today was the day to jump on a local headboat or charter boat for some sea bass and tog fishing. Are you sitting down? On the headboat, "Angler", everybody fishing for sea bass caught their limit in just a couple of hours. Numerous fish were in the 3 to 5 lb. range but NONE were larger than the 6.8 pounder caught by Justin Eddy of Ellicott City. That is a huge sea bass! Biggest one I have ever seen. A couple of years ago in January, we saw several 6 pounders caught but none that weighed 6.8 lbs. Fish were caught on clams on an offshore wreck. Even Super Mate, Rich Fouts caught a pair weighing 3 3/4 lbs. and 5 lbs. 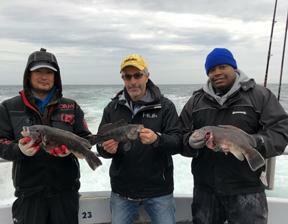 On the charter boat, "Fish Bound" , world record holder for tautog, Ken Westerfeld was at it again. Today he caught another potential world record when he caught a 17.4 pounder on 16 lb. test. Incredible!!! All of the anglers fishing on the "Fish Bound" had a good day. The anglers caught a boat limit including 6 over 10 lbs. 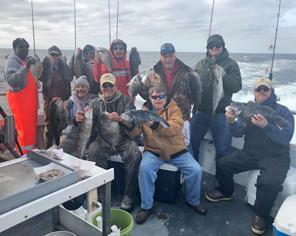 On the headboat, "Morning Star", the entire crew and anglers caught their limit of sea bass. They took a long run off the beach, but it was worth it. Poor winner caught a 21-incher. On the striped bass front, inside of the lovely 3-mile line was dead. There was some bird action down towards the Sliver, but more birds were seen diving 4 miles off the beach at 28th Street. The man as out there making sure nobody was fishing for stripers under the birds. Water temperature on the 3-mile line this morning was a little over 43-degrees, which is worrisome. It was a couple of degrees warmer a little further south. There could be a chance to get some fishing in early tomorrow, but starting tomorrow night through 6pm on Saturday there is a small craft warning. Winds early on Friday will be between 17 and 24 mph. It looks like some stripers have moved inside the 3-mile line. 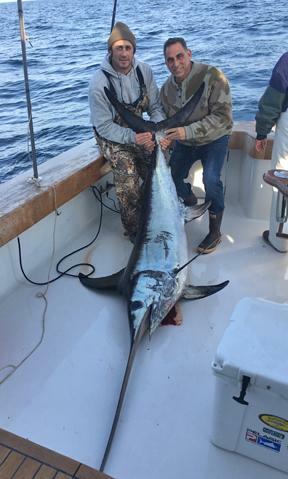 Pete Renzi on the "Fish Frenzi" caught a pair while trolling at Little Gull Shoal. Fish were in the mid-30 inch range. If the fish are at Little Gull, then there is a good chance they are north along the line. Banana Lump and off Sea Colony would be good bets. The striper bite along the coast is hit-or-miss. The fish are pretty scattered. Sounds like the best action was up towards the mouth of the Indian River Inlet although a few fish were caught inside 3-miles off the condos in North Ocean City. There hasn't been much to report lately. Anglers fishing inside 3-miles have been frustrated with the lack of stripers. Water temp has dropped down into the mid-40's, so that is concerning. 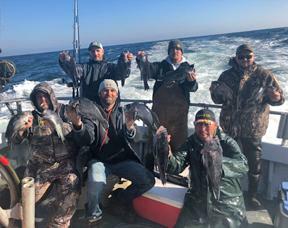 Boats heading in from offshore sea bass and tautog fishing have run across big schools of stripers 10 miles off the beach. Yesterday, a lot of stripers were caught off the Wildwood, NJ coast. Well, it looks like we may have a striper season afterall. A few stripers were caught late in the week and into Saturday. Sunday was a little sporty, keeping most at the dock. Most of the fish were caught up off of Sea Colony and down to the Pyramid. The class of fish looked like in the 32-inch range but a few big girls were hooked also. Water temperature dropped a couple of degrees but is still in the upper-40's. Still plenty of room. "Here at 50... Gone at 40". ** I HAVEN'T YET DECIDED ON THE COVER SHOT FOR THE WINTER ISSUE! We go to press in 2 weeks, so if you get a BIG fish send in the picture right away!!! THE COVER SHOT COULD BE YOU! Some nice size stripers were also caught by anglers fishing out of Lewes who made the run to the Jersey coast off Wildwood. Joe Huk caught a a 46-incher that weighed 38 lbs. Most reports coming in from those who ventured up to Jersey said that the majority of fish were in the 32-inch range. Stripers were also caught at The 8's in the Delaware Bay. Deb Grierson caught a 32.5-inch striper off the point at Cape Henlopen. Fish weighed 11.5 lbs. 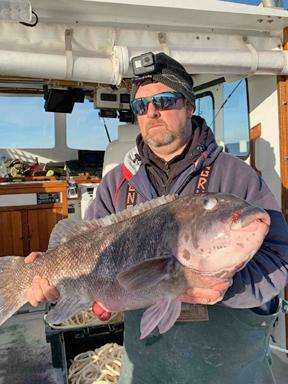 Ocean structure is giving up some good size tautog. White leggers were the bait of choice. Have seen quite a few in the 8-9 lb. class. Capt. Monty Hawkins on the headboat, "Morning Star" took a long trip out of Ocean City in search of sea bass that are really moving offshore now. Smaller sea bass are lagging behind. A few anglers had double digit catches of knotheads and 1 angler limited out. The largest was a fat 16.6-incher. On the headboat, "Morning Star", Capt. 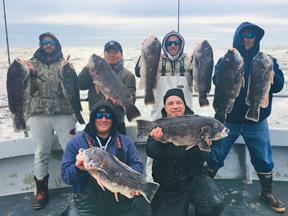 Monty took his anglers out for the first dedicated tautog trip since spring. The bite wasn't bad. Anglers hooked a lot of small fish. Most anglers had a couple of keeprs but were kept very busy with a lot of throwbacks. John Sadowski won the pool with a 22-incher. Still no stripers to report. Water temp is down under 46-degrees. Starting to get worried! Capt. Monty on the headboat, "Morning Star" didn't have fond thoughts about the weatherman when they reported winds to be 10-15 mph and they were more like 15 to 25 mph! But the fish were snapping!!! Had tog mixed in with sea bass. Gerald Meadows as high hook with 13 nice sea bass and a 21-inch tog. 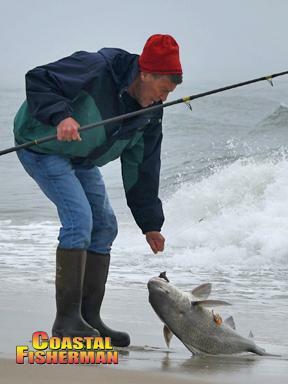 Terry Burgess took the sea bass pool with a 19-inch knothead that outweighed Mike Ransig's 19-incher. Capt. Monty will be running special 10-hour trips on Saturday and next Wednesday (12/12). Even though you have plenty of room to fish on the "Morning Star", Capt. Monty cuts 5 spots off the rail on these special trips to give anglers even more room. He is also doing some inshore tog trips on Friday (12/7) and Sunday (12/9). Rail is limited to the first 12 anglers who register. 1:19 PM - The Ocean City Marlin Club Rockfish Tournament has been cancelled! 2:15 PM - Capt. Nick Clemente on the charter boat, "Get Sum" reported good number of birds diving off the OC coast. He was able to get under the birds and marked good size schools of bait but didn't have any pulls. First off, the headboat, "Judith M" is looking for part-time captains for its evening cruise and for daily fishing trips. A 50-ton Master License is required. If interested, call 410-430-8420. The 7th Annual Ocean City Marlin Club Rockfish Tournament begins this Saturday and runs for 9-days, ending on December 15th. Registration is this Friday (12/06) at 6:00 PM at the Club. The striper bite is slow developing. I heard they were caught late last week off Cape May, but over the dreaded and unnecessary 3-mile line. Anglers are starting to find balls of bunker and sand eels inside the 3-mile line off our coast. Bluefish are out on the 1st and 2nd Lumps. 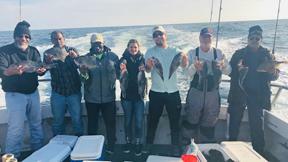 4:05 PM - No striper bite today in the ocean. Water was very dirty. Reports came in that chartreuse mojos were disappearing only 5-feet underwater. Anglers on the headboat, "Morning Star" had sea bass thick, 30-feet under the boat, but the bite was weak. Very poor on jigs... better on bait. today, Tim Calmer caught an 18-inch sea bass, the largest of the trip. Capt. Monty has 10-hour trips planned for Thursday, Friday and Saturday. 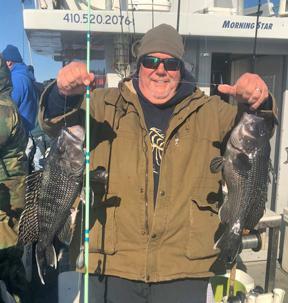 It was pretty "saucy" in the ocean today but that didn't keep anglers fishing on the headboat, "Morning Star" from returning with some limits of black sea bass. The largest measured 18 1/2-inches and was caught by Brett Selby. John Wooldridge and his son Grayson hit the Rt. 90 Bridge for some striper fishing and today was a good day. 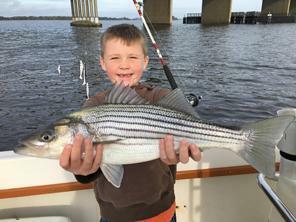 Little Grayson caught and released 5 stripers that were hooked while trollong umbrella rigs. Water was a little dirty and a brisk 46-degrees. John reported that some of the stripers had sea lice on them. 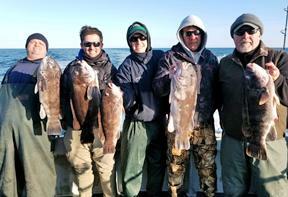 Anglers on the headboat, "Morning Star" took one of their popular 12-hour trips today, giving Capt. Monty the ability to venture out further than normal. 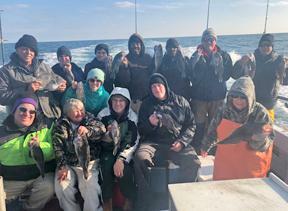 Anglers caught a variety of fish, including scup, triggerfish, cunner, pollock, tautog, bluefish and spiny dogs. A few guys limited out on sea bass. 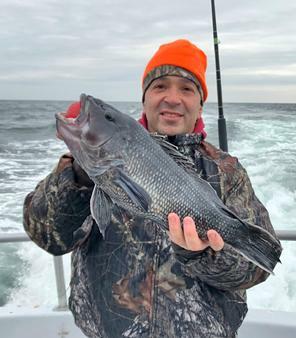 Gary Giordano's 22-incher was the largest sea bass of the trip. Capt. Monty on the headboat, "Morning Star" said the seas were sporty early today. When he anchored it was 26 knots out of the northwest. By the end of the day it was down to 12 knots. It was really nice when they got 15 miles off the beach. 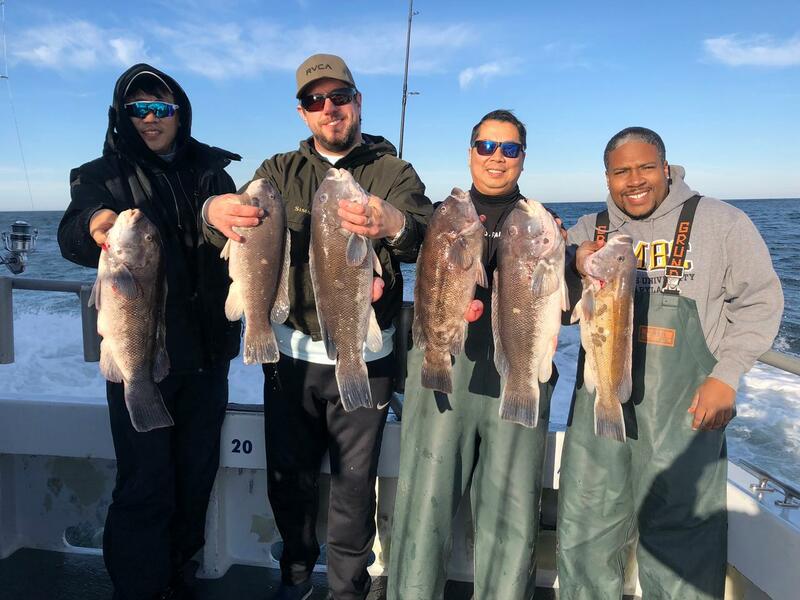 It was all worth it with a lot of anglers catching their limit of sea bass and some blue fish limits as well. Spiny dogfish were not as thick as they were further inshore. Largest sea bass measured 18 1/2-inches. 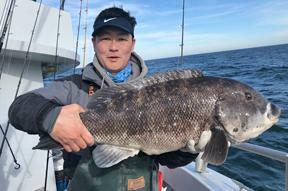 Sounds like you need to head further east than normal to get in on a sea bass bite due to very thick schools of dogfish sharks. There were some stripers caught at the 8's inside the Delaware Bay. The ones that you could keep were big, up to 48-inches, but many were in the slot. More and more are showing up everyday. Still, the bulk are off North Jersey and between Atlantic City and Cape May. I did hear that some wreckfishing boats ran across schools at the 1st and 2nd Lumps. With ocean temps hovering around 52-degrees only 10 miles off the coast, we are starting to get close to the arrival of stripers. I always say... here at 50 and gone at 40. Should be some bluefish around right now. I would check the 10-mile line. Also, Fenwick and Isle of Wight Shoals are familiar haunts. On the headboat, "Morning Star" there were several limits of sea bass around therail. Had to fight through the spiny dogfish to get it done. Pool winter was Mike Marcus with a 19 1/2 inch sea bass. Capt. Monty on the headboat, "Morning Star" reported an "awesome bite" today. His anglers had a "super-limit" with limits for everyone around the rail. Largest sea bass was a 21 1/2-incher. There was also a 27-inch bluefish caught by George Bell. All of this action was early before they had to head home due to increasing winds. 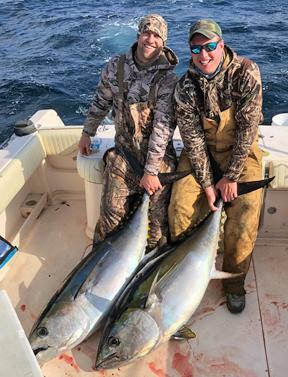 After fishing on Monday and Wednesday, anglers on the charter boat, "Reel Chaos" went 12 for 21 on swordfish in addition to catching a 66-inch bigeye tuna estimted at 200 lbs. Their largest swordfish was 82-inches and was estimated to weigh between 300 and 325 lbs. All of the fish were caught in 1,000 to 1,600 feet of water in the Baltimore Canyon. 9:37 AM - Updated yesterdays report. 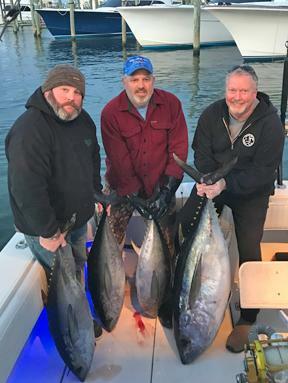 On Sunday aboard the "Magic Moment", Jim Bugg, Richard Hutchison, Mark hutchison, Tim Talbot and Brendon Barbey headed out to the 800/800 and caught 3 yellowfins, weighing up to 40 lbs., while trolling ballyhoo. They then deep dropped an eel in 1,500 feet of water and caught a 103 lb. bigeye on the first drop and a small swordfish on the second drop that they ended up releasing. Water temp was 64-degrees. Looks like a couple of boats got in on a good tuna bite yesterday. Justin Spies and Lawson Newcombt are all smiles after boating a doubleheader of bigeyes at the 800/800 in 400 fathoms. They were fishing on the "milliRem" with Capt. Mike Halsey and J.R. Spies. The guys reported life everywhere with yellowfins airing out on bait, but they could get any to bite. The bigeyes weighed 120 and 140 lbs. 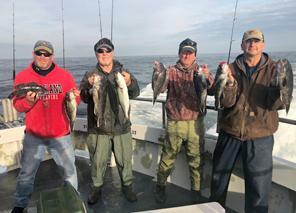 Yesterday, anglers on the headboat, "Morning Star" had a GREAT day of sea bass fishing during their 10-hour trip. Shailyn Strahl caught her limit in an hour and EVERY angler, including the crew, ended up with their limit of knotheads. This keeps the streak alive for Capt. Monty who has recorded a boat limit of sea bass on every one of his 10 and 12 hour trips this fall. 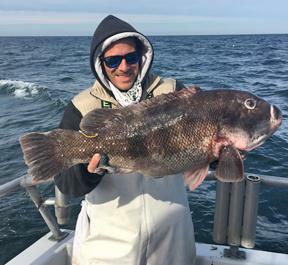 The largest sea bass measured 18-inches. UPDATE: On the charter boat, "Fish Bound", angler Chan Park caught and released a 14 lb. tog. Fish ate a sand flea in 35-feet of water on an inshore wreck. 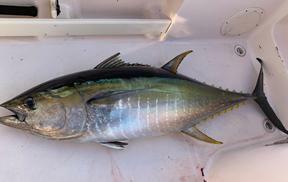 Who would have ever thought we would be reporting tuna catches in mid-November. 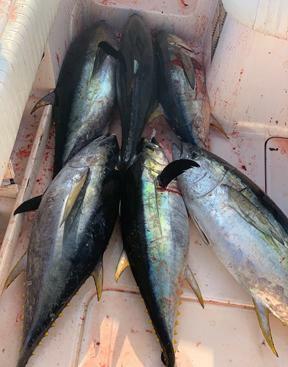 Today, Brian Arni and his crew on the "Get Reel" fished behind the Poor Man's Canyon and ended up with 6 yellowfins, 2 bigeyes and a mako release. Yesterday, anglers fishing in the surf off Lewes, DE caught some stripers, but today it was nothing but dog sharks. Big Bird Cropper did catch a 31-inch striper in the OC Inlet today. If you are looking to do some Chesapeake Bay striper fishing, Capt. Nick Clemente on the "Ivy Sea" is fishing out of Deal Island. You can give him a call at 410-430-5709. Anglers on the headboat, "Morning Star" dealt with 20-25 mph winds until around 1 in the afternoon, when it got pretty according to Capt. Monty Hawkins. 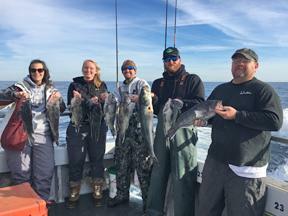 A few anglers caught their limit of sea bass and quite a few caught double-digits. Also had a triggerfish and some fat bluefish in the mix. Largest sea bass was a 17 3/4-incher caught by Butch Walter.